Al Fin Energy: Nuclear Fuel Was Meant to be Recycled: What's Wrong With the NRC? Nuclear Fuel Was Meant to be Recycled: What's Wrong With the NRC? Failure to pursue a program for recycling spent nuclear fuel has put the U.S. far behind other countries. It represents a missed opportunity to enhance the nation's energy security and influence other countries. These themes are the heart of a talk by Dale Klein, Ph.D., (left) the former chairman of the Nuclear Regulatory Commission (NRC) given Sunday, Feb 20 at a session of the AAAS annual meeting being held in Washington, DC. Dale Klein, who is now Associate Vice Chancellor for Research at the University of Texas System, said largely unfounded concerns and "long-held myths" about the reprocessing of spent fuel have prevented the U.S. from tapping into an extremely valuable resource. Spent nuclear fuel, which includes some plutonium, often is inaccurately referred to as waste, Klein said. The US NRC is basically slow about everything it does. Consequently, the US is thrown to the back of the pack, in terms of new nuclear development. For that to change, the entire political makeup of the US NRC must be overthrown. The first step in recycling fuel is separating the plutonium from the remaining uranium (about 96% of the spent fuel) and the fission products with other wastes (together about 3%). Then the plutonium needs to be separated from most or all of the uranium. All this is undertaken at a reprocessing plant. The plutonium, as an oxide, is then mixed with depleted uranium left over from an enrichment plant to form fresh mixed oxide fuel (MOX, which is UO2+PuO2). MOX fuel, consisting of about 7-9% plutonium mixed with depleted uranium, is equivalent to uranium oxide fuel enriched to about 4.5% 235U, assuming that the plutonium has about two-thirds fissile isotopes. If weapons-grade plutonium were used (>90% 239Pu), only about 5% plutonium would be needed in the mix. Reprocessing of 850 tonnes of French used fuel per year (about 15 years after discharge) produces 8.5 tonnes of plutonium (immediately recycled as 100 tonnes of MOX) and 810 tonnes of reprocessed uranium (RepU). Of this about two thirds is converted into stable oxide form for storage. One third of the RepU is re-enriched and EdF has demonstrated its use in 900 MWe power reactors. Fast neutron reactors allow multiple recyclings of plutonium, since all transuranic isotopes there are fissionable, but in thermal reactors isotopic degradation limits the plutonium recycling potential and most spent MOX fuel is stored pending the deployment of more effective fast reactors. The plutonium isotopic composition of used MOX fuel at 45 GWd/tU burnup is about 37% 239Pu, 32% 240Pu, 16% 241Pu, 12% 242Pu and 4% 238Pu. France, Russia, and the UK are storing fuel in preparation for newer Gen-IV reactors which can utilise it. 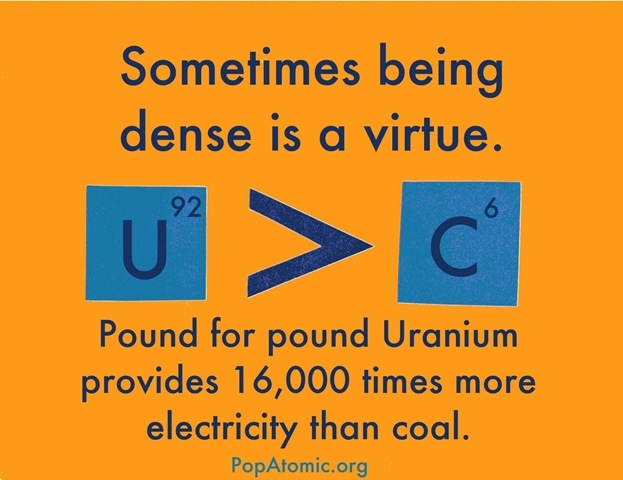 Another problem spot for the US NRC is its inability to study safer, cheaper, more reliable reactor designs without charging companies exorbitantly extortionate fees for the service. It looks as if even tiny Jamaica may approve and utilise new small modular reactors (SMRs) before the US gets around to it. SMRs operating costs (O&M+fuel) are estimated at around US 2¢/kWh and the capacity factor is more than 90 per cent. Estimated total project costs (TPC) is expected to vary between US$3,000/kW and US$6,000/kW (about US 11¢/kWh and US 15¢/kWh). The electricity production from SMRs would qualify for carbon credits, varying between US 2¢/kWh and 5¢/kWh (assuming the carbon tax/trading at US$16 to US$36 per tonne). Of course the current Obama regime policy of "energy starvation" will last years beyond the exit of Obama from the White House. That is the way of bureaucratic inertia and an innate Luddism within large bureaucracies. So by the time all the Obama-Green detritus and leavings are cleaned out and sanitised it may be decades before SMRs are widely adopted in the US.